Our online store features some of our fanciest and most unique boards. Each board is accurately described and has multiple pictures. 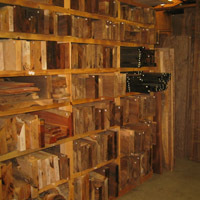 All of our lumber is air-dried to 8% moisture content and surfaced on two sides unless otherwise noted. Online checkout includes a UPS ground shipping calculator. For secure online payment you will be transferred to PayPal. An account is not required. Please call or use the contact page to inquire about additional inventory that is not listed in our web store or to place an order without using the online checkout. We enjoy working personally with our customers.